The CAG Forum offers some great ways to easily keep up to date on what's happening with news, threads & events! First: Simply clicking on the "Unread Content" button will allow you to see the most recent posts since your last visit. 1. Simply click on your account name and select "Account Settings"
- Send me news and information will ensure you are subscribed to the CAG email list. We send out emails (usually once a month) with updates on events and other CAG news. - Automatically follow content will keep you in touch with Responses to any post you create or to others that you post a reply. 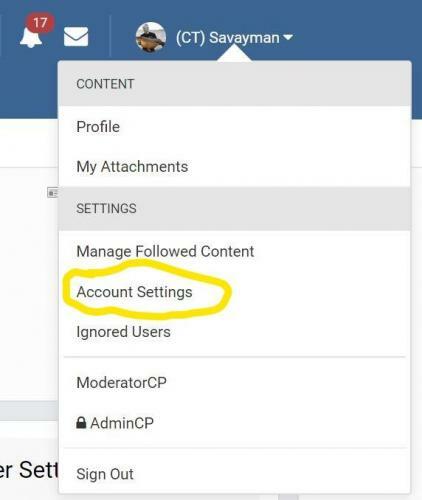 - Method to use for content I follow automatically Here you can select the method (email) and frequency of receiving updates. Once you made your selection don forget to click the "Save" button! Please make sure your email address is up to date to receive this information! We'll post another thread on how to set up from the Mobile version.